The walking tour was very informative. We walked down tha Mall, and our guide talked about the different places along it. She allowed time for us to stop and take photos. The palace was amazing. It says no backpacks, but they allow small ones like day packs in. Our guide Ben was so wonderful! Very informative. Loved this tour, started at the far end of St James Park and our guide gave us a historical lesson as we walked toward Buckingham Palace. NOTE - If you use HEARING AIDS, let the company know in advance and they will have over the ear headsets for you, otherwise they are the ear plug ones. This is how she communicated her dialogue with you. Also, sort of notice what your fellow group members are wearing so you dont go astray as there are many groups out. Once at the Palace you go in a seperate entrance and your guide leaves you. You are then given an audio/video player that walks you through the rooms and describes them. This is at your own pace but plan on 1/12 to 2 hours. You are not allowed photography inside so youll want to stop by the the gift shop and get the official guide book. Enjoyed this a lot. Our guide talked constantly about royal history on the walk up the Mall to the palace and made our entrance painless. Really enjoyed seeing the inside of the palace. Highly recommend when available. 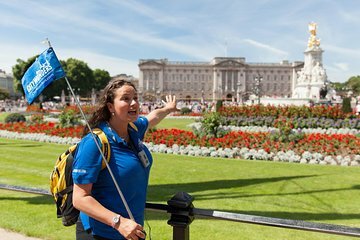 The walking tour at the beginning of the Buckingham palace tour was very informative. It set the tone of the entire palace tour. It is a must see experience. Loved loved loved it all. How awesome to go inside Buckingham Palace. I had to pinch myself. We loved our walking tour guide, Joshua. He provided informative and fun facts on our way to the Palace. Gave us plenty of time for photo ops in several spots along the way. At the Palace, it was great skipping the line and moving right into the security check area. josh made sure we all were safely inside before leaving us to the Palace tour. The self guided tour of the Palace was good. Of course very crowded but we never felt hurried along, it really is at your own pace. I'd recommend this tour to anyone wanting to see inside Buckingham Palace. this was a great tour. We had a excellent guide named Robert that was fun and very engaging. The actual meeting place for the start of the tour was a little confusing but understand now why we had to start at the top of the park to get it all in for the walking tour. We did not sign up for the tea and I am glad that I didn't because it would have only allotted an hour in the palace and we spent a good 2 1/2 hours in the palace which was definitely needed. Loved the hand held audio guides, very modern.